Super Typhoon Trami looks "as if somebody pulled the planet's gigantic plug," according to European Space Agency astronaut Alexander Gerst, who posted this image to Twitter Sept. 25. As Super Typhoon Trami migrates northwest across the Pacific Ocean toward Japan and Taiwan, astronauts on the International Space Station got quite the view of the intense storm. European Space Agency astronaut Alexander Gerst shared several pictures of the typhoon earlier yesterday (Sept. 27), which to him looked like water flushing down a drain. "As if somebody pulled the planet's gigantic plug. 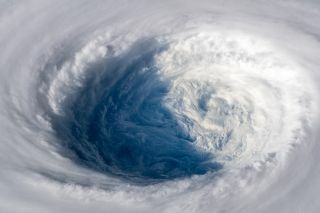 Staring down the eye of yet another fierce storm," Gerst wrote on Twitter, along with the pictures. "Category 5 Super Typhoon Trami is unstoppable and heading for Japan and Taiwan. Be safe down there! #TyphoonTrami"
Gerst and the other five Expedition 56 astronauts are part of a network of observers keeping an eye on the intense storm. Another part of the network consists of Earth-orbiting satellites. Also today, the National Oceanic and Atmospheric Administration tweeted a short animation showing the typhoon in infrared light, courtesy of the Japanese Himawari-8 weather satellite. "Less than ten days after Super Typhoon Mangkhut battered the Philippines and southern China, another powerful tropical cyclone is churning through the western Pacific Ocean," National Oceanic and Atmospheric Administration (NOAA) officials wrote in an accompanying statement. The agency warned that Japan's Ryukyu Islands and parts of Taiwan could be under threat from the storm later on this week. A view of Super Typhoon Trami captured at 12:23 a.m. EDT (0423 GMT) Sept. 24 from the NOAA-20 polar orbiting satellite. On Monday (Sept. 24), the Moderate Resolution Imaging Spectroradiometer (MODIS) instrument aboard NASA's Terra satellite took a picture of Typhoon Trami in visible light. The images showed that Trami's eye of the storm back then was an astounding 37 nautical miles in diameter (nearly 43 miles, or 68 kilometers), NASA officials said in a statement. That's about three times the length of Manhattan Island. Trami was first classified as a tropical storm on Sept. 21, then grew stronger as the storm traveled across warmer waters in the Philippine Sea, according to NOAA. Trami's winds have been measured as high as 150 mph (241 km/h). It was expected to reach minimum speeds of 157 mph, or 253 km/hr in the next day. As of 11 a.m. EDT (1500 GMT) yesterday, the maximum winds were about 104 mph or 167 km/hr, measured by the NASA-NOAA Suomi NPP satellite, NASA officials said.